I'll be posting brief updates there more often than I update the blog - which I generally reserve for longer rants or conversations. Blog traffic has spiked the last couple days so I know there are a lot of people out there looking for information. The best information that I have available currently is that Senator Ranzenhofer's office confirmed to me that the EI rates have been cut 5%. In brief Facebook exchanges with NYSOTA they are also reporting the same information. A digital news service that covers NYC news is also reporting similar information. I spoke with people in the NYSDOH and EI programs specifically and they are keeping their lips sealed for now. I encourage everyone to open up the current American Journal of Occupational Therapy and read 'Effects of therapy cushions on classroom behaviors of children with autism spectrum disorder.' This is a fantastic article that looks at the issue of whether or not seat cushions were effective at promoting 'in seat' and 'on task' behavior. If the number of hits to this blog regarding early intervention and the NYS budget are any indication - this is a MAJOR point of concern for therapists. Our traffic has been influenced heavily by this issue in the last month. Also, it is not just NY traffic - people around the country have been watching the proposed budget cuts to the NYS Early Intervention Program. This week the Senate and the Assembly each put forward their own modifications to the budget and the budget reconciliation process begins. Click on the links to get to the respective budget proposals. For those who are not aware, IEP Direct is a proprietary Internet-based software package that many school districts use for IEP writing. One value of this kind of tool is that there is more uniformity and subsequent adherence to regulation when IEPs are created in this format. However, a serious negative is that therapists often over-rely on the canned goals that are part of the drop down menus in the software. I am not sure who writes/approves the canned goals in IEP Direct but some of them are rather silly. Being a former full time educator myself I know that academic programs spend quite a bit of time teaching students how to write appropriate goals that are both functional and measurable. Something seems to happen between the classroom and practice because the quality of many goals that I see written for children in school settings is very poor. Narrative analysis and meaning making in the face of vicious cycles. Melissa is a happy three year old. 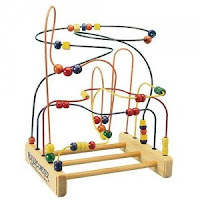 She smiled brightly as she played with the 20 year old bead and wire toy in my waiting room. I am amazed at the durability of this toy that was originally a favorite of my oldest daughter. It has been played with by thousands of children over many years. Melissa talked quietly to herself as she slid the beads along their paths. Some of those paths are rather uniform and follow a predictable and simple geometric trajectory. Other paths twist, turn, climb and dip unexpectedly. All of them begin on one side of the toy and end on the other side of the toy. Melissa's grandmother usually brings her to occupational therapy but her thirty-something year old father also began coming to therapy sessions. He was recently released from prison and a mandatory rehabilitation program. He has a long and repetitive history of substance abuse and criminal behavior. No one knows where the mother is.